That has been a question that Alison and I have been asked dozens of times over the past few weeks. So I have thought about it quite often, and realized that there are many different answers! One answer is yes, we have made great strides in settling in to our lives here in east Belfast. In the past month, we have moved into the home we are renting, gotten the girls started in school, unpacked all of our boxes, and continued the enjoyable process of getting to know people at East Belfast Mission. Life feels very different than in late August, when Alison and I were driving back and forth from her parent’s home (1.5 hours each way) to come to Belfast! Yet in another way, we have a long way to go! Though everything is out of boxes, there are still many things to do to make our house a ‘home’. Though the girls have started in school, we have a new baby coming any day now (Alison is one week away from her due date today! ), and though we have had many chances to meet people here, meaningful relationships take time and space to form. While there is stability that will naturally form over the next six months for us, I have enjoyed reflecting recently about some of the Biblical passages that deal with people in transition. In the book of Exodus, after God has led the people out of slavery, the people learn to depend on God day by day as they collect manna each morning for their sustenance. Daily bread. Mercy that is new every morning. We pray, “give us our daily bread”, looking to form our own lives in a way that trust in God with every passing moment. Whether we are “settling in” to a new place or not, that is a constant challenge for all of us who seek to walk humbly with God. In some ways, our lives being in transition does link up with the journey of East Belfast Mission at this time, as we live in temporary facilities for the next year while construction continues on the new building. Here is a picture of the current construction of the Skainos project, buildings which will contain not only the ministries of East Belfast Mission, but also a range of other partnerships. As we have gotten to know some of the people and ministries of the mission, it has wonderful to see the ways in which East Belfast Mission reaches into the community to meet some very real and tangible needs. One of these ministries is a hostel for the homeless called Hosford House. 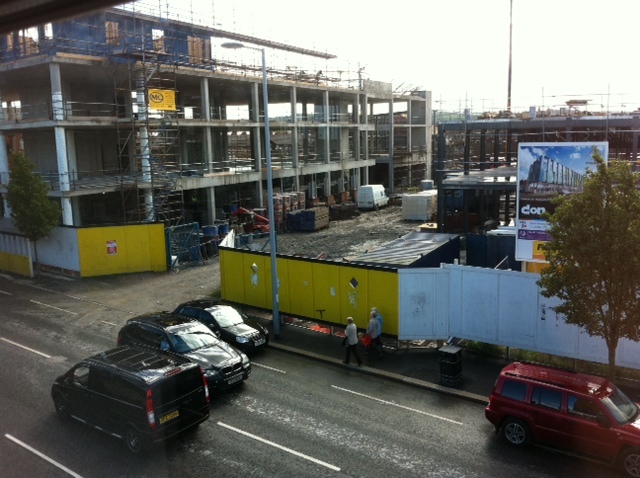 This is currently a 22 bed facility, and will expand to 26 beds when the Skainos facility opens next year. They do a great job of seeking to support, care, and empower people who have run into a difficult time in their lives. This Saturday, for instance, there is a team of staff and residents from Hosford House that are competing together in a tri-athalon in Dublin together. The last link (which is to a fundraising page for the triathalon, has a few more examples of the ways in which Hosford House seeks to creatively support their people. We continue to appreciate your prayers, especially as we await the arrival of our third child. May you know and give thanks for the love of God on this day. Britt and Alison, just last night at a church meeting here at St. Luke’s someone asked how you were doing and we remembered you in prayer. Best wishes for a safe and QUICK delivery for the baby, Alison! Love from Orlando! We miss you so very much. FUMCO is starting to move into the new building this weekend. First Baptist will match any $ that we make at the Souper up to $75K. Our thoughts and prayers are with you and especially at this time of great expectancy. It’s good to see the update. I kept thinking about you today and missing your family at the dedication and opening of the new building at First United Methodist Orlando. (The ‘gathering area’ reminds me of a big Panera Bread or something!) Given the date of your post hopefully Alison has had the baby… we will be keeping you in prayer and wishing the best for all of you!